Once more with feeling… I will be delivering my talk “Amazing Design Through Empathy” at NJ Connect in Redbank, NJ on Tuesday, September 23rd at 6PM. This is the fourth time that I am delivering this presentation, and the first time that I am doing it locally. So far the reactions from it have been wonderful. 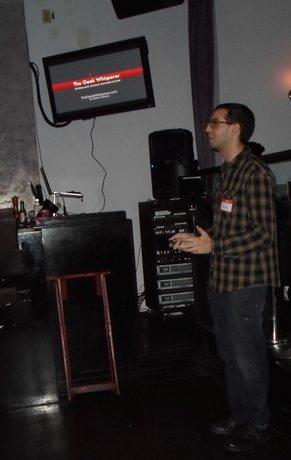 I spoke at NJ Connect about two years ago, and it was a very warm and fun group. I’m excited to do it again. The difference between a good product and an amazing one boils down to one thing: Empathy. Developing an understanding of your users that is so deep that you can feel what they feel enables you to design products and experiences that will truly resonate with your users. Through illustrative and entertaining examples, I will take you on a tour of the the highs that are achievable through empathic design, and some of the depths that designers sink to when they design without empathy. You’ll learn how to activate the empathy that is already within you, and how you can use that power to improve all aspects of your product design, from requirements gathering to user research, and everything in between. PS: Good news! I will not be featuring any cliched examples. You will not hear me mention Apple or Jony Ive once during my presentation, because I have empathy for you. Please sign up! I hope to see some friendly faces. If I didn’t have such a busy week that week, I’d be there. Good luck!